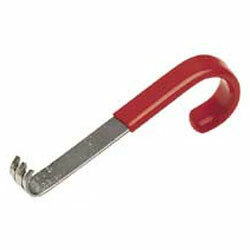 This wire stripper assure effortless stripping of insulation without nicking or scratching the conductor. The stripper is made of durable stainless steel and its curved handle is cushioned with a soft vinyl covering for user comfort. The double slot stripper accommodates two different wire gauges in a single tool with one slot for each wire gauge.